The Frost Tech D55 range are a series of attractive slim line refrigerated multi deck display units in mirror finished stainless steel. 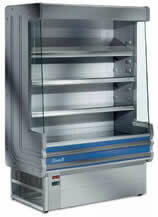 These multi deck displays are ideal for deli and dairy product applications. The D55 Frost Tech range of multi deck slim line displays are ideal for where space is an issue. The Frost Tech D75 range are a series of attractive refrigerated multi deck display units in mirror finished stainless steel. These multi deck displays are ideal for deli and dairy product applications. 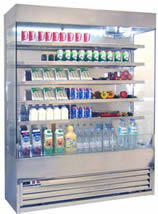 The Arneg Odessa 2 is a wall cabinet suited for displaying fresh meats and salami, dairy products, fruit and vegetables. Distinguished by its ample visibility, thanks to the special large-sized panoramic glasses, it stands out for its refined design that is expressed in elegant and functional lines. The Arneg Odessa 2 is Arneg's highest capacity integral multi-deck display. With large 450mm shelves and 611mm deck the Odessa-2 is ideal for the retailer who has requirements for high capacity display and is restricted to a remote option. The Danny multideck display is an illuminated refrigerated multideck display combining modern styling with strong robust construction. The ideal choice for retailers, selling pre-cooked meats, milk & dairy products, sandwiches or chilled drinks, The Danny Multideck display is available in 1.0m/1.2m/1.5m/1.8m/2.0m sizes. The Danny range includes 4 strong stainless steel shelves with adjustable brackets. Also standard are an external thermometer with digital display enabling easy temperature monitoring and an energy saving night blind. The number one choice for shop keepers world-wide, The Arneg Nimes multideck cabinet combines the highest quality with maximum display area. 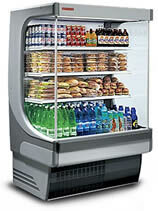 Perfect for everything from beer and wines to dairy products and soft drinks. Using unique, advanced materials and technologies, the Arneg Nimes 2 is designed and built to ensure optimum performance with minimum energy-consumption, guaranteeing efficiency and environmental friendship. The compact dimensions and large display area with 25 mm pitch give the Arneg Nimes 2 multideck display the role of an excellent display cabinet capable of satisfy any display and layout needs. The Arneg Trent Multideck display is an extremely efficient and reliable wall unit. Combining its simple installation, easy clean finishing and excellent value for money the Arneg Trent is a very popular multideck display cabinet. It is ideal for the sale of cold meats, dairy products or fruit and vegetables and despite its limited size the Arneg Trent multideck display cabinet is a particularly suitable model for specialist shops and small supermarkets, ensuring an excellent product-displaying capacity.